Your cleanroom suit, coverall or general apparel is only as good as the fibers that make up with fabric and the seams that hold the fabrics together. Are your cleanroom garment seams constructed using best practices? Below, we’ll walk through the differences between serged seams and bound seams in cleanroom garment construction and identify why it matters for the protection of your cleanroom, your product, and the safety of your team members. Why Does Cleanroom Garment Seam Construction Matter? A seam is any permanent attachment of two or more materials in a line formed by joining the separate material pieces. A proper seam finish is designed to prevent particle generation from the raw edges of material, reduce breakthrough from the wearer, and add strength to withstand normal wear. Often, end-users focus on the permeability of the fabric and overlook the construction of the seams resulting in an ineffective garment in a strict environment. In the case of cleanrooms and controlled environments, seam construction should enhance the integrity of the garment. Additional particulates being generated by the garment entering the cleanroom. In this scenario the garment itself becomes a source of contamination. Potential risk of breakthrough from the wearer contaminating the cleanroom and potential harm to your employees by strike through of hazardous substances being used in your operations. Excursions occurring during gowning or normal wear because the seam does not have the strength to withstand a stringent sterile gowning process or repetitive moments in manufacturing. Cleanroom garments have two primary functions: protect your clean environment and protect your employees. As such, ensuring that your seams are properly constructed is critical. What should you look for in cleanroom suit seam construction? Keep reading below. Do you know the IEST standards for Cleanroom Apparel? Download a free whitepaper now to learn more. What is a Serged Seam? A serged seam is considered an edge-finishing method. A serged seam takes the right sides of fabric and stitches them together on the edge, leaving a visible seam line. While this method produces a strong seam, it does expose fibers of the fabric along the edges and may contribute to added particulates in your environment. In addition, the seam itself could leave room for break through. What is a Bound Seam? A bound seam uses an appropriate bias tape or seam binding to encase the cut seam edges and enclose the fabric edges. This method completely covers seam edges and increases seam strength. 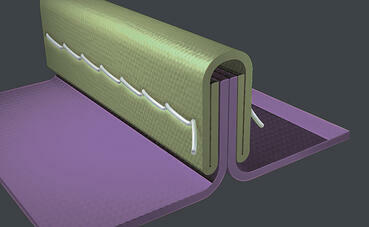 Moreover, a bound seam provides an improved barrier from break through and protection from strike through. A bound seam, therefore, is the ideal seam selection for cleanroom and controlled environment suits, frocks, coveralls, and general apparel. If you’re looking for high-quality cleanroom suits, frocks, coveralls and general apparel, CleanMax® has you covered. Moreover, CleanMax is constructed with shorter, more frequent stitches. CleanMax requires 7-8 stitches per inch (SPI). More short stitches typically means there are stronger connections at the seams. Sometimes a lower SPI often indicates lower quality. Garments with a low SPI are typically less durable. Learn more about how to upgrade your apparel to CleanMax now. What Else Should You Consider For Your Cleanroom Apparel? Understanding the best construction practices for cleanroom apparel is critical for your controlled environment. Take a look at some additional resources that may help you.